rebel against those who come to their gigs and spend the entire time on their phones! It is frustrating attending a gig and seeing a sea of people filming the entire set on their Smartphone or whatever they have available! When researching for a piece on Kate Bush; I was listening to an interview she gave to promote her Before the Dawn live album and she was asked about phones - she requested people not to record and be involved in the actual show. By and large, most of the audience obeyed and could not turn down an order from Kate Bush. In fact, it was more of a polite request. I wonder why you’d go a huge gig like that and film it. Maybe you’d want the posterity and proof that it happened – knowing it will never be released on DVD – but you wonder how much of the actual music is being missed! You cannot get any real sense of what is happening and what the mood is if you are looking at a screen and seeing everything second-hand. Prince had a policy regarding phones at his gigs and wanted to have the audience paying attention to what was happening. It is difficult for musicians to enjoy what they are doing and actually spend time connecting with fans if they cannot see eyes. Jack White is someone else who has come to the point of being angered by fans using their fans when watching him perform. He heard an artist – maybe Beck or someone like that – who got the audience to put their phones in a special pouch that was locked and could only be opened if they stepped outside of the venue. They would be able to use it away from the actual gig but would not be able to get at it during the performance. I feel this is an incentive that should be rolled out across all live performances. We do not need to take photos and record video when we are at a gig. If you are more concerned with what is happening on the phone and less bothered about the physical reality of the performance then I wonder what the point it! The person who compelled this piece is Paul McCartney. He played a legendary gig at the Cavern Club earlier this week and gave his crowd a free show! The only thing he asked was people actually put down their phones and respected what he and the band were doing. That seems like a pretty good deal for someone who about to embark on a life-affirming and brilliant set! Most people were willing to oblige but there were some who had their phones and were filming things. If you come to a Paul McCartney gig and are too busy taking pictures and filming then there must be something wrong with you! He gave those guilty a warning and explained why he was doing that. He had seen other artists have a no-phones policy and he wanted to connect with the crowd. It seems reasonable and I wonder why we all get so hooked and unable to give up that addiction. When Jack White was speaking; he felt like there was a wave of blue screens and technology blocking the view and causing a distraction. If people are being sly then they look down and he cannot see their eyes. He is not sure what they want from his set as they cannot provide reaction and response. Because of that, he has to fly by the seat of his pants and guess things. When you go to a gig; you need to be in the moment and give that instant response to what is happening. An artist vibes from that and they know the audience are in the moment and with them. If you are too busy and are engrossed on a phone then it is a rather synthetic and strained experience. Some people (idiots) defend the phone at gigs because we get great videos and memes – the videos are always crap and the quality is terrible. Why would you watch a gig on a shaky and poor-quality video?! I find it baffling anyone would get any enjoyment out of it at all. “The smartphone issue is such a big deal because, well, everyone has one now! For some, they're an essential part of the gig experience – snapping some shots for Instagram, a selfie with your mates in the crowd, a Snapchat video to tease friends who couldn't get tickets. For others, they're annoying, produce rubbish photos and videos, and get in the way – how can you enjoy the gig if you're watching it through a tiny screen? Bands themselves are divided – Kate Bush, the Yeah Yeah Yeahs and Neutral Milk Hotel are among high-profile acts who have banned smartphones from their gigs, while others like Fall Out Boy and Weezer encourage loyal fans to upload their gig photos to Crowd Album. As lovers of music and sellers of phones, we felt compelled to get involved in the debate, and surveyed the UK's gig-goers to find out their views. We also chatted to a few of our favourite up-and-coming acts – the bands and artists for whom social media exposure is the most useful – to hear their side”. “For those who are fed up with iPhone screens blocking their view of the stage – take heart, because it could be worse. Of the people we surveyed, only 44% said they used their phone at live music events, although this does rise to well over three quarters (79%) for the 18-24 age group – the bulk of the gig-going public. Fortunately, at least, people are mostly watching the bands – 73% only used their phones to take pictures at concerts and gigs, rather than quickly checking Facebook during the new songs. And although young people use their phone more, they're more concerned with documenting the gig than with checking social media – it's older men who are the most likely to be tweeting through the set. The public remains in their favour too – just. 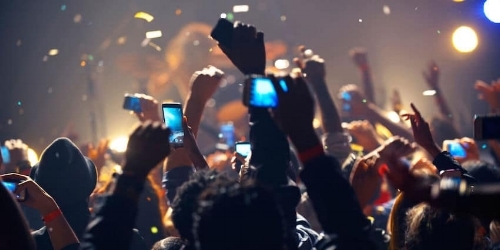 Slightly under half (46%) said that phones should be banned at live music events, so the majority are still pro-phone, although two-thirds (69%) did say that they would keep their phone in their pocket if the artist requested – whether it was being enforced or not”. The piece went on to interview various artists and their views. Many said a total ban on Smartphones would be too radical and wrong. They are in favour of pictures being taken but less happy with footage being taken and filming a whole gig. I do not feel you can have modifiers and be half-arsed when it comes to phones. Whilst I feel having them locked away might be wrong – in case someone received an urgent text or does not have a watch and needs to know the time – I do not get the need to document the gig and post to social media. “Do you think smartphones should be banned from gigs? I think that should be down to the artist that is playing; some musicians and singers are distracted or think that the audience are not getting the full experience. I believe if they paid for a ticket they can do what they like”. The dilemma comes when you have the legendary artists against the new breed. The upcoming musicians often rely on people sharing snaps and videos online to get their fanbase up. It can be useful having videos showing their set and getting others engaged through seeing that performance and being tempted to go. We are in a time when promotion is everywhere and artists rely on social media and spend so much time there. I wonder, if they want that sort of promotion, get somewhere (one person) to post a video from the official site. By that, I mean have an official photographer or person filming gigs and putting them online. You get better quality and it means others at the gigs do not need to get their phones out! “Guns N’ Roses, Jarvis Cocker, Alicia Keys and the late Prince all made a stand against fans who filmed their gigs with phones. Two years ago American folk rock band the Lumineers even put the house lights up to shame those who were “ruining the ambience” of their concerts, urging their audience to “be more present with us”. 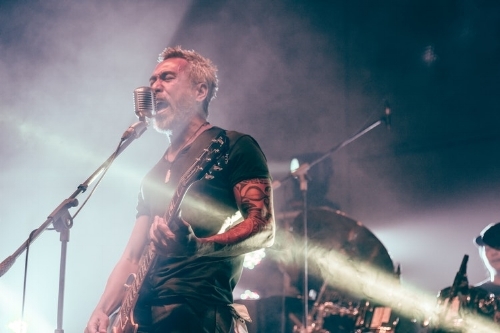 For music-lovers it might seem a simple way to record a real-life encounter with an idol, but now the question of who controls the images of a live concert is becoming a big issue for performers. After Jack White, the former White Stripes frontman, decided last month to stop the use of smartphones at gigs, hip-hop superstar Kendrick Lamar, who launched his European tour in Dublin last week, is the latest high-profile performer to attempt to take charge of his image in the face of modern technology. The Grammy-award winning rapper, who has collaborated on the soundtrack of the new Black Panther Marvel film, is not even letting professional photographers into the auditorium for this leg of his tour. While the rapper’s management did allow a few official photographers into the North American dates of his show, showcasing songs from his latest album Damn, Lamar’s fresh concern to limit the market is an attempt to protect his valuable “brand” and ensure the appetite for tickets remains keen. A large part of the income of the music industry, even for bestselling artists, relies on the profits made by concert tours”. A lot of my trouble concerns people’s real motives behind shooting video and photos. A lot of people do so to get popular on social media and gain some sort of status. Many people post to Instagram and do so for credit and a false sense of celebrity; many do not bother to watch the videos back and most people in the world do not want to see photos of them and friends watching Taylor Swift or Foo Fighters. For personal memories, then you cannot object to a few photos or whatever – if someone was celebrating a birthday or it was a rare chance to see your favourite artists. When it comes to those who spread it all over social media and turn it into a huge event…that is where I start to run up against things. Whilst only one-third of young people want phones banned at gigs; I feel there need to be limits and people actually should question why they are at gigs. I wonder why they spend all that money and then shut yourself away and not properly pay attention to what is happening on the stage. If you want a few quick shots, and it is not distracting to their artist, then that is the line. I disagree with those who do not mind fans filming because it creates buzz and attention for their music. The music itself is the way to get attention and is why people release songs! If you need to rely on fans’ videos and photos to get more people your way then I query how good the music itself really is. I think people should be able to keep their phones with them but show a lot more respect and keep them in their pockets! Some artists are standing up and getting tough but too many are either suffering in silence or being a bit timid regarding rules. The live experience is a precious thing and the best way to enjoy the music and hold onto memories is actually watching the artist. I doubt the posts that are on social media will be remembered and recalled years from now! If you literally watch a gig and pay attention then that will stay in the mind longer and stay lodged in the memory. “It may already be too late, given that many no longer see a problem at all. With Adele tickets costing as much as a three-star mini-break in Cyprus, some fans argued it was their right to harvest all the footage they wanted. After all, didn’t the punters already fight and win the home-taping-is-killing-concerts war a decade ago, when stars would regularly issue YouTube takedown notices on any inaudible three-second pixel-soup? The truth is that it is always going to be an imperfect solution when the imagined expressive freedom of our musical lives is turned into a patronising prison ritual. The choice isn’t always obvious. Would the raw blood and faeces of a GG Allin performance have suffered from people Snapchatting jumpy video stacked with poopy emojis? Or would his art have suffered more from the indignity of a microchipped neoprene baggie in every pocket? It’s another one for Plato”. KEPT it pure and human.